I was talking with my newly-retired mom when she mentioned she was tired and feeling like she wasn’t getting a break. My ears perked up immediately because I’d heard her say those same things when she was working full-time—but I didn’t expect to hear them again once she retired. What was keeping her time from being her own? So I asked her. She explained her daily schedule to me and how she felt like she was always going, never getting free time to go do what she wanted. So why did my mom have no time for fun, despite having just retired from her full-time job? From what I could tell, it was Parkinson’s Law in action: “Work expands to fill the time allotted for it.” If given ample time to complete a task, we will find ways to make it take the full duration of the time allotted, even if the task could be completed in less time. How does this happen to one who is retired? One issue is that Mom had no timeline for completion of her work items, nor did she create a set list of tasks. If we don’t set firm boundaries for when things needed to be completed, Parkinson’s Law takes over, and the work permeates our entire life, creating the illusion that there is no “free time” for fun. And that means stress. Parkinson’s Law is a major co-factor in the game of stress management. Failing to set boundaries for work tasks is stressful. You’re never ‘off duty’. The work just hangs over your head all the time, and the fun never seems to materialize. The outcome? Mom had far more time on her hands in retirement, but the busy-ness seemed to consume just as much time as when she was working full-time. So how do you avoid Parkinson’s law sucking all the fun and play out of your busy life? Create a list of “work” items with deadlines, so that you can see what’s really on your plate. As the saying goes, better the devil you know than the devil you don’t. Simply saying “I have work to get done” is unspecific and thus, unfocused. When you can clearly see the specific work that lies ahead, you can then begin to itemize your time accordingly. Stop trying to multi-task, and stop procrastinating. Allow for complete focus on one item at a time, rather than halfway dealing with three items at once. And stop doing all those menial tasks that need to be done but aren’t as important as the big stuff—procrastination further fosters that cloud of dread hanging over your head. Hold firm on your deadlines. Deadlines mean nothing if not adhered to, and while our word is good, external reminders are better. This could be as simple as writing down the work to be done on a sticky note with the targeted completion date, and sticking it somewhere you’ll see it regularly. Of course, this last one isn’t as easy as it sounds. As much as I love a good “to-do list” on a sticky note, for me, it’s too easy to avoid. So let’s talk about some strategies for working more efficiently, and preserving your fun time. Schedule clearly defined work times. When you can look at a situation objectively and logically, you’ll be able to set boundaries for the ‘work’ without any associated emotions of guilt, worry, or “should”ness (the act of continuing to work on an item because you feel like you “should”). You could go day-by-day, take a week overview, or do both. Ahead of each day, set specific time periods each day for working, and when the time is up, it’s up. You can now rest easy and enjoy your free time because you know you’ve put in solid effort on the work, and you’ve earned some fun. Use an app like “Remember the Milk” to help with work scheduling. I’m not exaggerating when I tell you that this app has changed my life. Within the app, you can set up time-sensitive to-do lists and the app will email, text, and track exactly what you’re supposed to be working on at that specific time, as well as put looming deadlines right in front of your eyes. You have to note whether the item is low, medium, or high priority, and physically check off once you’ve completed the task. And if you have to postpone the deadline, there’s a section for notes to remind you at a later time where you were at in the project and what you were working on. Set rules for yourself about checking email or social media. We know just how distracting the near-constant checking of apps and emails is to your train of thought. If you’re regularly taking breaks from your work to check email or scroll through a social media app, you’re bringing ‘free’ time into ‘work’ time, and thus diluting the quality with which you can focus on completing the work. After reading Tim Ferris’ 4-Hour Workweek, I implemented his suggestion for having designated spaces for checking email, and not checking email outside of those times. This allows you to stay on your schedule, not on the schedule of the email and its sender. I found that if I checked emails first thing in the morning, my creativity was hampered for the rest of the day. But if I did two hours of creative work first thing, then checked and replied to emails mid-morning, I could be productive while still being timely in my email responses. Once you start bringing focus and clarity to your work and fun times, you’ll likely notice your stress levels going down. All you have to do now is follow the plan you’ve set forth—and we know having a good plan makes your brain happy. As for my mom? She’s committed verbally, with deadlines, to a few tasks she is going to complete on her ‘work’ end of things. It is my hope that with that set in place, she will now have time to start exploring what incredibly fun things she can start making time for in her life. Read Kate’s follow-up post (What Really Makes You Happy?) 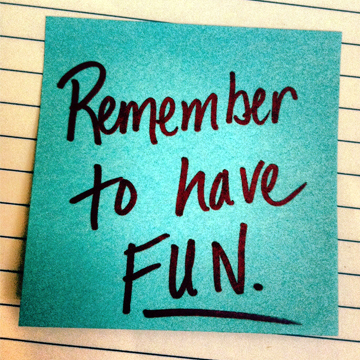 and take the next step in building fun into your life. Kate Galliett is the creator of Fit for Real Life, where she brings together body, mind, and movement to help people become highly-charged and fit for real life. She is also the owner of ProKine Performance, a strength and conditioning gym in Saint Charles, IL. She and her team build intelligent, comprehensive, fitness programs for all of their members, and are proud to provide strength coaching for a large portion of the local endurance athlete community. She holds a BS in Exercise Science and has worked as a fitness professional for 11 years. Her secret ingredient is always smoked paprika. Loved this post and agree 110%… I will definitely be implementing some of these practices immediately! Thanks Kate, must say a simply intriguing woman. Good article ! Thank you so much, I don’t know what i can do when deadline coming.